Hey All! I’m going to be partisipating, and making tons of yummy goodies for this amazing bake sale. So, if you live in the Phoenix, Arizona area come stop by. It’s far a really awesome cause and you’ll get to try some really yummy home made goodies. It will be held on Saturday, May 14th, from 11:00am – 3:00pm at 5th and Wine. It’s located in Downtown Scottsdale, and the address is 7051 East 5th Avenue Scottsdale, Arizona 85251. There will be raffle prizes and lots of amazing food, but the best part is, that just by buying some goodies you will be playing a small part in Share Our Strength’s efforts to end childhood hunger. Hope to see you there!! 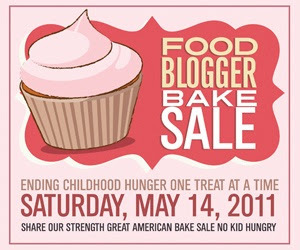 See Also: Food Blogger Bake Sale and Taste of the Nation! !